The ROOTS Institute represents a next-generation approach to Animal Assisted Facilitation education and professional certification, providing a scientifically and ethically sound paradigm shift in the understanding and teaching of Animal/Equine Assisted Self Development, Animal/Equine Assisted Psychotherapy, and nonhuman animal well-being and welfare advocacy. 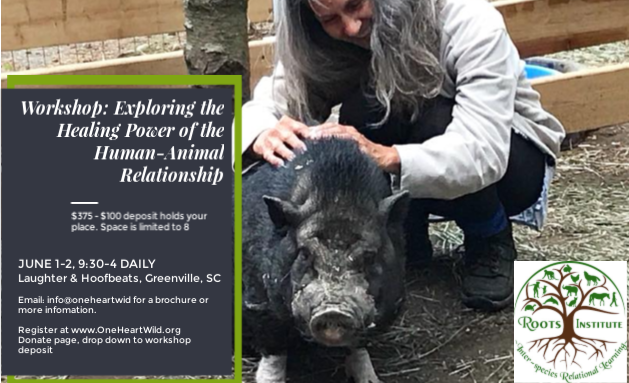 By studying inter-species relationship through a Trans-species Psychology lens integrating psychology, ethology, ecology, and neuroscience, students will be prepared to facilitate exceptionally effective programs that are equally beneficial to all beings involved. That is what distinguishes the ROOTS Institute from other programs. 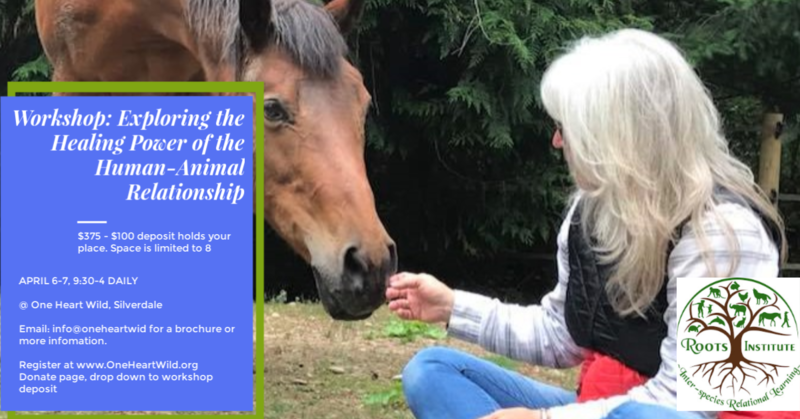 No other Animal/Equine Assisted Facilitation Education model was designed from day one for the mutual benefit of both human beings and nonhuman animals. We believe that this is not only an ethical imperative, but a practical one as well, as it adds layers of beneficial, nature-based, empathic understanding for our students and clients alike. The nine month training programs includes; a combination of state-of-the-art online learning and testing, onsite experiential learning where students put their knowledge to work exploring inter-species relationships through a non-dominant lens, building facilitation skills within their scope of practice, and faculty mentoring upon receiving certification. 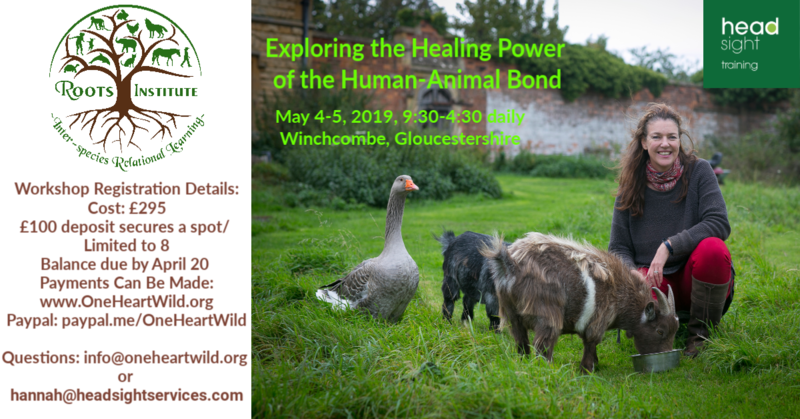 Students and people interested in experiencing the ROOTS model can attend a 2-day introductory workshop in the US or the UK; Exploring the Healing Power of the Human-Animal Bond. Level 1 will take students 3-4 months to complete depending on the length of time it takes to get through the online learning, some of which must be completed prior to attending the 5-day onsite portion of the training. Level 1 students will understand a ROOTS informed approach to animal/equine assisted therapeutic interventions upon completion. Students wishing to be Certified ROOTS Institute Practitioners will continue on to Level 2. Students should be able to complete this level in 6-7 months while they complete field and online assignments, and build skill proficiency in preparation for two 4-day onsite experiential training classes. Currently workshops are held in Washington and South Carolina in the US and in Gloucestershire, UK. Levels 1, 2 are held in Washington State at One Heart Wild Sanctuary and in Gloucestershire, UK. Master Classes for certified practitioners are held in the US at One Heart Wild Sanctuary. The field of animal assisted self development and psychotherapy is dynamic and rapidly developing. ROOTS Institute meets or exceeds the 2016 American Counseling Association's comprehensive animal assisted therapy facilitator training competencies. ROOTS Institute Faculty is committed to staying abreast of the most current science affecting our field as well as participating in future research projects. ROOTS informed students and certificate holders become an integral part of a professional network supported through continuing education, mentoring/supervision, and education conferences to stay current with the latest science affecting our field. Students completing certification programs will have a variety of continuing education opportunities. For more information on ROOTS workshop and Level 1 and 2 training dates, locations or for more information, contact us.